In this session, Nations Trust Bank Chief Information Officer Nisala Kodippili will explore how local banks are adopting digital transformation in Sri Lanka. He will also discuss a few initiatives taken by Nations Trust Bank in its digital transformation strategy. 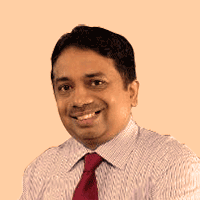 Nisala is an information technology professional with more than 20 years of experience specializing in the banking industry with strong leadership and management skills. He has a wealth of exposure in managing IT Infrastructure, communication technologies, system and database administration, information security, cards and digital technology solutions in financial sector.